My Home Office Tour...And How I Designed It On a Budget! When Paul and I were in the process of purchasing our first home last winter, having a 3-bedroom, 2-bathroom setup was the end goal - and that’s not because a nursery is coming anytime soon! It’s because I’ve always dreamed of having my own home office, and one that I could design and make my own. Once we moved in, I knew that the second guest room with all of those tall sunny windows was destined to become my office. I moved my existing desk in, and...that’s about it. After moving from Atlanta to Denver to St. Louis in the span of three years, I had to downsize my belongings and my “office” setup was looking a little grim. Until I started doing what I do best: bargain hunting. With a little elbow grease and creativity, I was able to design a home office that radiates my ideal aesthetic for under $300, complete with all of the little touches that make it feel like home. Wondering how you can do the same for your work-from-home space? 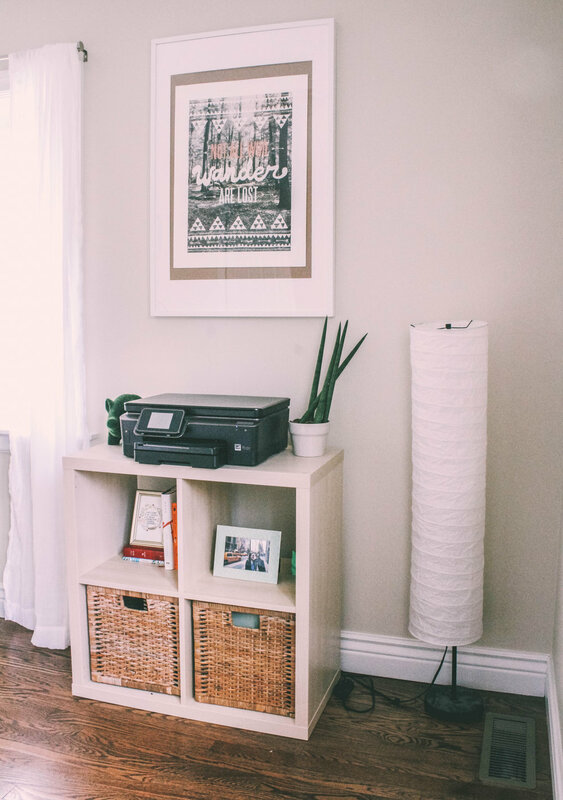 I’m sharing a few of my favorite home office decor tips and bargain steals below! Thrift stores are your best friend - for select items. Ever since I was young, I’ve loved the rush of unearthing an unforgettable find in a thrift store. Over the years I’ve thrifted some of my favorite pieces: the perfect $2 black sundress, impeccable $8 Italian leather oxfords and the $3 quote art print that now adorns one of my office walls (originally $20 at Urban Outfitters, what?!). Thrift stores are great for home office decor bargains like picture frames, floor planters (I thrifted the awesome seafoam-colored number in front of my window) and even unused and sealed office supplies like folders. However, I wouldn’t recommend them for items like rugs and office chairs, which may be harder to clean and inspect for defects prior to bringing them home. Art prints are expensive. Print yours instead! I love a good gallery wall, and have had one in my home ever since I moved into my first solo apartment four years ago. Art prints can be expensive, so my favorite wall decor hack is this: I would buy cheap, basic frames from IKEA (these here, to be exact!) and would print out inspirational art prints that I either designed or would stumble upon on Pinterest. Sure - these prints aren’t quite the same quality as framed and matted art prints, but they do the job for now! If you’re looking for great photography to print out for your walls, I can’t recommend Unsplash enough. All images are free domain, high-resolution and print-ready. Personally, a home office space with clean lines and lots of natural light is what gets me in the ready-to-work mindset. Embrace intentionality when designing your home office space, and ask yourself: “Will that armchair that I’m tempted to buy and sit in the corner add purpose to my work, or is it just another piece of furniture that I want to buy?” Less distractions around you means more time to crack down and focus on the work that matters most to you. What would your *dream* home office look like? Describe it for me in the comments below, or show me on Instagram!